Since 2012 we have created a legendary show ‘Autism’s Got Talent’, that has received high media attention. Unlike other charities, this show is a star studded spectacular event will showcase amazingly talented performances by adults and children with autism. The performers consist of singers, actors, musicians and dance troupes, will fly the flag for autism and show what people with autism are capable of. Click here and download the form, complete the details and email to lisa.robins@annakennedyonline.com to purchase your tickets!! We are looking for talent! you could be singers, dancers, musicians, comedians and gymnasts plus, those with more unusual acts to share for the Autism’s Got Talent Roadshow – Cornwall. 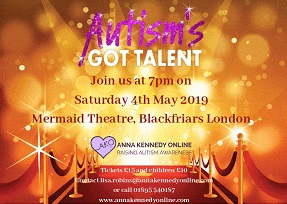 Anna Kennedy Online created Autism’s Got Talent, which is a star studded spectacular event and showcases amazingly talented performances by adults and children with autism. The performers, which consist of singers, actors, musicians and dance troupes, fly the flag for autism every year since 2012 and show what people with Autism and Aspergers syndrome are capable of. Autism’s Got Talent is growing in popularity each year.